The historic village of Giornico (405 m) is located in the lower Leventina, between Faido and Biasca, right on the river Ticino. The village has retained its typical Ticino charm. Paved streets, beautiful Roman bridges over the Ticino, uninhabited Rusticos and many small Rebhaine draw this, spared by tourism place of. Nearly vertical cliffs rise east of the village, thunder down on which stunning in a heavy rain falls. Ideal for nature lovers and sportsmen are the mountain trails in the nearest or distant surroundings. The beautiful hiking area of ​​St. Gotthard is by car in half an hour reached that the Greina on the Bleniotal in approximately one hour. By bike you can ride through Rebhaine and the Ticino along to Biasca. The landlord two mountain bikes can be rented. For bouldering Giornico is ideally located. The gneiss boulder of Chironico (about 15 minutes drive from Giornico away), are world famous and have become a Mecca Boulder. Also easily accessible are the Boulder Cresciano. 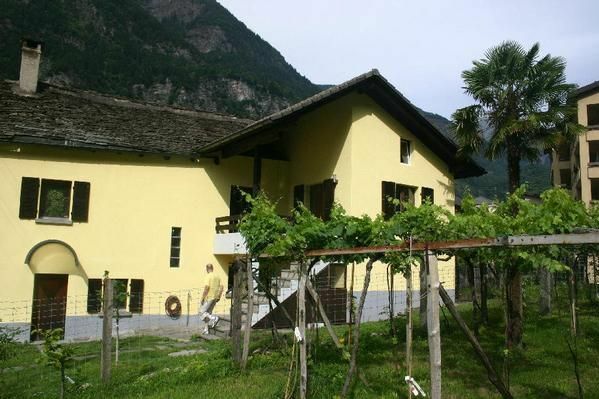 For motorcyclists the location is ideal, because the house is just off the popular Gotthard route. Gotthard, Nufenen, Lukmanier, Oberalp, Furka, San Bernardino, which are like traffic routes pass nearby. To adjust the bikes a garage. Railway enthusiasts come in the middle of the Gotthard railway line with your steep hairpin bends their money. In winter you can reach by cable car, chair-lifts and the nearby ski resorts of Airolo, Cari (above Faido), Nara (Blenio) and Campo (Blenio). Interior The apartment is accessed via two exterior staircases, through the garden, with separate entrance. It is equipped with a large living / dining / bedroom with new wood stove, ceramic floor and modern leather sofas (to queen bed place), with direct access to the 5m2 large, covered terrace. One bedroom with 140cm bed, another room with sofa bed (145 cm). The kitchen has real parquet floor, wooden table with real Ticino chairs, ceramic glass / wood stove, oven and dishwasher and a 3 m2 balcony. Small bathroom / WC. The layout of the rooms is adapted to the approximately 200-year house. This means that the rooms are small, except for the living room. The second bedroom is a connecting room to the kitchen and has a pull out bed for 2 persons. The house has no central heating but a modern wood stove. If you want to rent the house in the cold season, it is essential that you take pleasure in firing with wood. House / Residence The carefully renovated, charming semi-detached house in the village center, directly by the stream, the house Rebhain, in the immediate vicinity of mail, postal bus stop, Denner and butchery. Also within walking distance wood fired pizzeria, osteria, 2 romantic Grottis, playground and banking. The house is located on the main road, ideal for excursions in all directions. For people who like it quiet and secluded, the apartment is not suitable. The access by car is up right in front of the house mögich, garage and parking space are available. Public parking is about 100m away. - Towels: once per object by the tenant bring (compulsory). - Bed linen: to be rented once per person for 8 CHF (compulsory). Historic center with museum (currently under renovation), beautiful Roman bridges, 3 old churches, many vineyards. 1 typical Ticino wood oven pizzeria, 1 osteria, 2 grottis directly on the Ticino. Cobblestone streets invite you to go for a little or longer walk. Giornico is a place that has retained the charm of Ticino, is spared from the large tourist influx. Here one speaks another Ticino dialect which is very different from place to place.